The pivot to spring you ask? More like the rusted cog seized in refusal to spin up spring. Mother Nature, have you no oil can? Have you no mercy? Despite a brief touch of warmth we have been summarily dismissed to low 40s, gloom, and biting winds. Winter in the Mid-Atlantic battles on. Another year, another backloaded winter. It’s a back door cold front the did us in this time. Further freezing seasonal gears in their ruddy place. But never doubt the will daffodils. They are rocking in full shine. Sure they made headway two to three weeks later than usual, but in yesterday’s 70s they splayed in full glory. 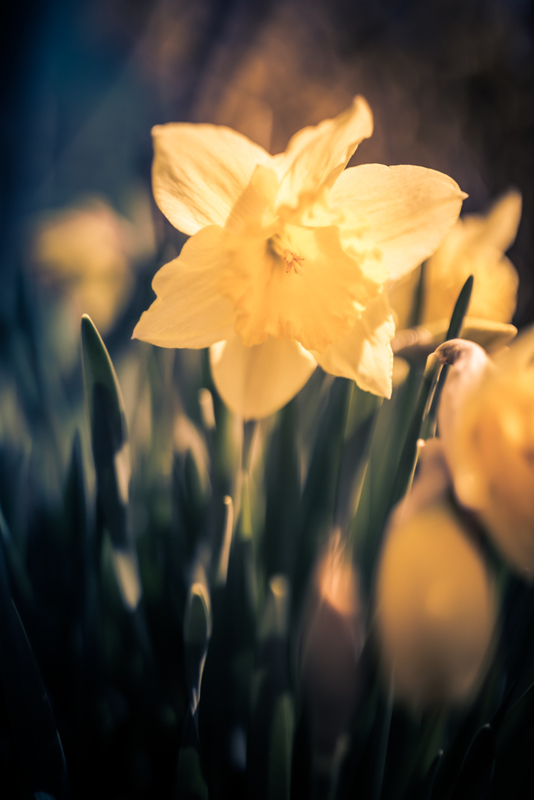 Crocus, hyacinth, and daffodils serve as standard bearers of spring. The first to push through and remind us warmer climes lay in wait. It’s with fair certainty I’ve made an iteration of this daffodil photograph since 2012. It’s an exciting reminder that flowers are back and it never gets old. I talk often about revisiting photographs. I maintain it is good practice. No matter how similar, no two photographs are ever the same. So make them over and over again. The world is fluid and the arrow of time forever points forward. We’re always changing, aging, moving. The same is never the same—so capture those moments and lock away the moment. Now if you don’t mind I am off to don my winter coat and gripe more about things I cannot control.